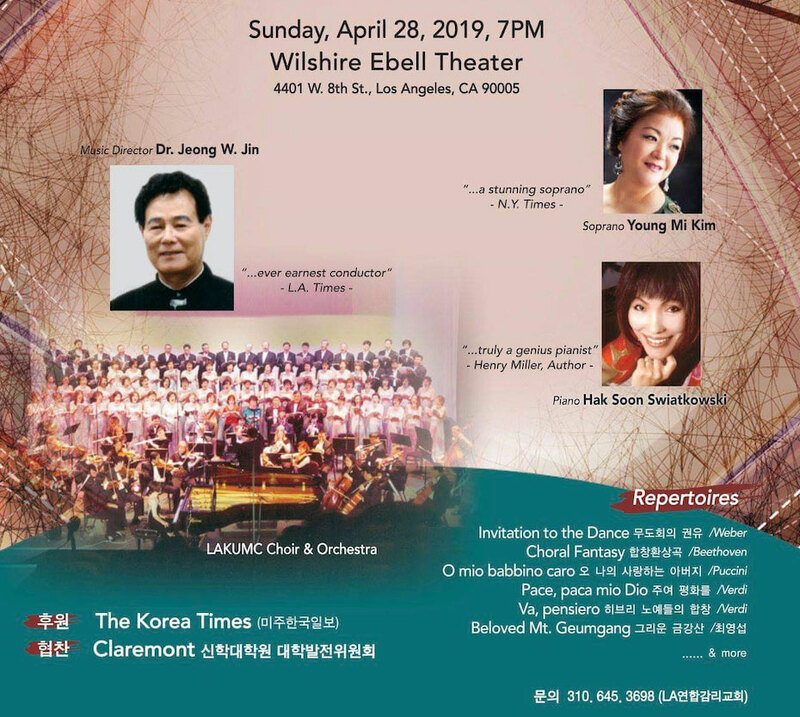 The L.A. Korean United Methodist Church (LAKUMC), which is celebrating the 115th anniversary of its founding, will host a special music concert on 28 April at 7 pm, at Wilshire Ebell Theater. LAKUMC, founded in 1904 as the first Korean church in America, has played a mothering role for Korean-American church ministry in America. Of particular note is that LAKUMC has worked not only for spiritual care for the first and second generations of Korean-Americans, but has also cultivated world-class Korean theologians, global leadership, and well-prepared pastors for Korean-American church communities through its supportive cooperation with Claremont School of Theology (CST). There is a longstanding relationship between LAKUMC and CST, and LAKUMC has supported CST in its unshakable commitment to educational vocation and ongoing development. The Rev. Dae Hee Park, who founded the Korean Endowment Fund (KEF) at CST, was the senior pastor at LAKUMC from 1980 to 1990. As of 2019, Rev. Chang Min Lee, who is an alumnus of CST, is taking charge as the senior pastor. This concert is cooperatively sponsored by the International Relations Office of CST and all of CST will be welcomed at this special concert. For questions or tickets, please contact kef@cst.edu or kyungmok.lee@cst.edu. 엘에이 연합감리교회(LAKUMC)는 창립 115주년을 맞이하여 뜻 깊은 음악회를 개최합니다. 엘에이 연합감리교회는 1904년에 설립된 미국 최초 한인감리교회로서, 재미한인선교 역사에서 어머니교회와 같은 역할을 해왔습니다. LAKUMC의 역사적 발자취가 더욱 의미있는 이유는, 재미 한인들의 영적 돌봄 뿐만이 아니라, 세계적 리더쉽을 겸비한 차세대 목회자 양성을 위해 교육선교에 헌신해 왔기 때문입니다. 특별히, LAKUMC는 클레어몬트 신학대학원과의 지속적 후원관계를 통하여, 양질의 목회자 양성을 위해 노력해왔습니다. 1980년부터 1990년까지 LAKUMC에서 담임목회를 하셨던 故 박대희 목사님은 최초로 클레어몬트 신학대학원 한인학생을 위한 장학기금, Korean Endowment Fund (KEF)를 창립하였고, 지금까지 많은 한인학생들이 이 기금을 통하여 학업과 목회자 수련에 정진해 오고 있습니다. 2019년 현재 LAKUMC는 클레어몬트 신학대학원 동문이신 이창민 목사께서 담임하고 있습니다. 클레어몬트 신학대학원이 후원하는 이번 LAKUMC 115주년 기념 음악회는 4월 28일(주일) 저녁 7시 Wishire Ebell Theater에서 열립니다. 클레어몬트 클레어몬트 신학대학원 재학생을 포함한 관계자는 모두 음악회에 참석할 수 있습니다. 자세한 음악회 티켓 문의는 kef@cst.edu or kyungmok.lee@cst.edu로 하실 수 있습니다.